Even though we’ve never done one before we’ve decided to make a bucket list for the summer! Usually we like things to be low key and laid back in the summertime, but then we came up with the idea of old school activities for children! You know what I mean–all of the fun summertime activities that we used to do when we were younger. Some of the activities on the list are ones we love, some we don’t do enough, and some we haven’t done before, but all of them are ones we want to pass down to our children. I’m excited to share some of my childhood with my kids! 1. Play kick the can. 5. Go swimming after dark. 7. Sing jump rope songs. 9. Camp out in the backyard. 13. Have a water balloon fight. 14. 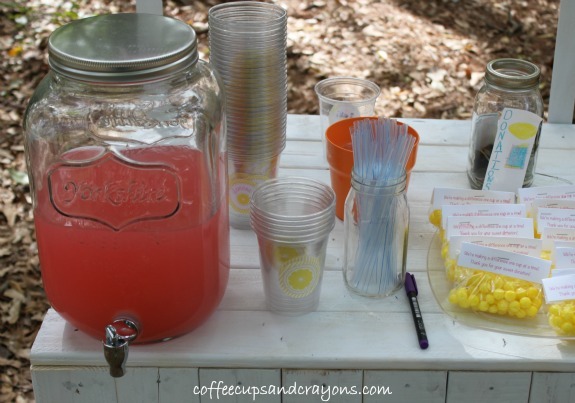 Host a lemonade stand. 16. Play clapping games like Miss Mary Mack (Mack Mack). 17. Make tin can lanterns. 18. Tie dye a shirt. 21. Have a hose fight. 23. Slide down the slip ‘n slide. 24. Roast marshmallows over the fire. 33. Run through the sprinkler. 36. Eat ice cream in our pajamas. 37. Go to a drive in movie. 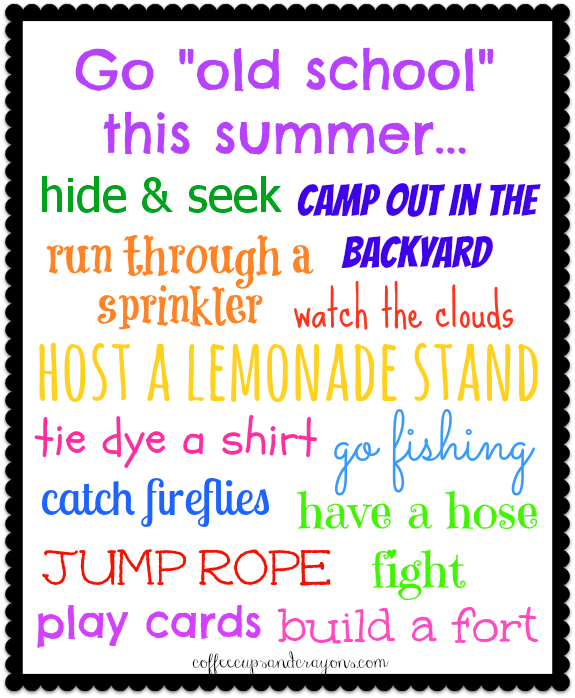 These are some of the activities we are going to do this summer–I can’t wait! What about you? What would you add to an “old school” bucket list for summer? Brilliant post, Megan! I felt like your list was a compilation of someone who had a tape of my summers through high school. 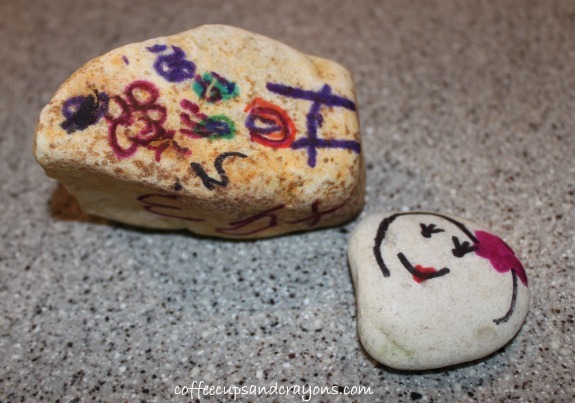 I am going to do many of these with my young grandsons and will keep this post to continue to move through the list as they reach the ages to do the rest of the activities! Thank you! That’s fantastic! I’m looking forward to a fun, lazy summer and wish you the same! Awww! Thanks! It was the only kind of bucket list I could commit to for the summer! I love this list!! One question, what is spit? That is not something we ever played in my neighborhood! It’s a card game! I’ll have to do it soon so I can post about it! It’s fun! I always feel so heartbroken that my kids can’t camp out in the backyard. It’s just not the same on a fire escape. lol This is a wonderful list, though. LOL! You need to pretend camp one night in the family room then! You can sleep in a fort and tell spooky stories! No animals. No bugs. And you could secretly sneak back into your bed to sleep if you wanted to! Love the list and I plan to use it, but I would like to give fair warning on the lemonade stand one. Kids can only do a lemonade stand if they get a permit. Seriously. You have to obtain a business permit or the cops will shut down your stand. So before you encourage your young ones to do a lemonade stand, look into the permit for your area and prevent a heartbroken child. Leave a jigsaw puzzle set up on a table for rainy days or quiet activity during the heat of the day or evening time. Make ‘stilts’ out of the big cans that pineapple juice comes in. LOVE these!!!! How could I have left mud pies off???? I could think of a whole bunch more, I just don’t have the recollection I used to have. I so love reading this, even though I don’t have any children, I think of my childhood fondly.